We exclusively reported last year that Samsung is going to launch its second Windows 10 tablet in a few months. It’s going to be a successor to the company’s first Windows 10-powered hybrid tablet, the Galaxy TabPro S. Presuming that Samsung sticks to its naming convention, this new tablet will be called the Galaxy TabPro S2 and given that it has now received its Wi-Fi certification, it’s one step closer to launch. Our report mentioned that Samsung is going to offer four models of the new Galaxy TabPro: SM-W728, SM-W727, SM-W723, and SM-W720. It’s possible that some of these variants might offer LTE support. 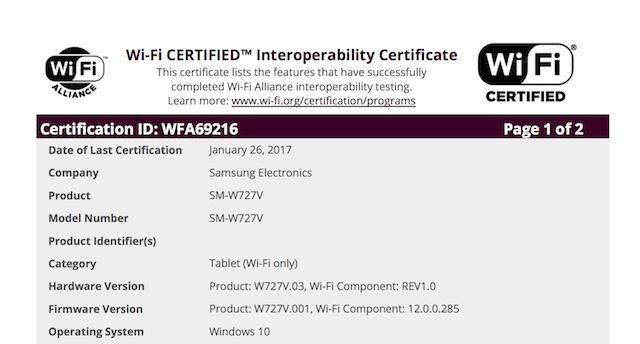 We’ve spotted the Wi-Fi certification for the SM-W727V and it’s only a matter of time before the others go through this process as well. Details about the specifications of this tablet are slim at this point in time but it’s likely going to tout a 12-inch Super AMOLED display with 2160×1440 pixel resolution and the latest Intel Core M series processors. It’s possible that Samsung might launch this new Windows 10-powered tablet at the Mobile World Congress 2017 next month. The company is also expected to launch the Galaxy Tab S3 at this event. I thought the TabPro S was a great device crippled by limiting the RAM to 4GB. I hope they boost it to 8GB at least in the new one.